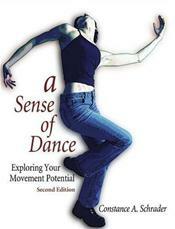 A Sense of Dance: Exploring Your Movement Potential, Second Edition, is written for true beginners.students who are exploring the art form for the first time and are not likely to describe themselves as dancers. Through this text, students discover that dance is an accessible art form that can bring greater self-awareness and self-confidence. It helps new dancers learn how to express themselves through dance. This second edition, based on an already-successful textbook, features three new chapters that add even more depth to the topics covered. The chapters address the power of dance through time and place, culture, and community; a sense of style; and patterns of coordination.